The Buddy Studio Pak is a virtual production studio that will speed up your workflow and make you more money. Designed by studio photographers, it includes over 180 actions for building albums, one click portrait matts, dynamic image filters, one-click studio collateral templates for brochures, business cards, zed cards, DVD Jewel cases, everything you need to promote your business. It also includes a 189 styles collection for coloring monograms, dingbats, wedding phrases and high school varsity letters. 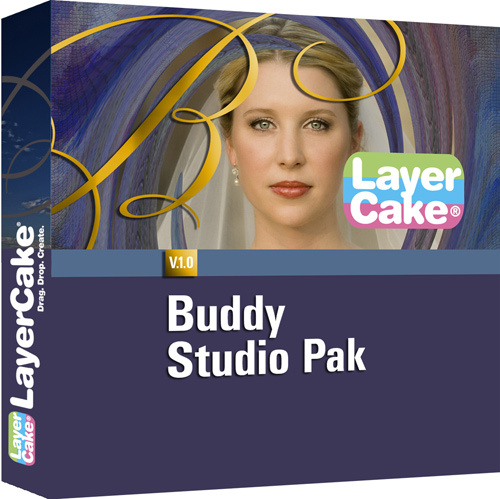 It’s not all: There are over 60 magnificent museum quality drag & drop frames, 75 ornaments, monograms, 140 signature backgrounds (with collections such as Sports, Grunge, Kiddie Pops, Traditional, and Hollywood), as well as step-by-step tutorials on every facet of the Buddy Studio Pak. Tags: Adobe, Americana, brochures, business, Digital, Digital Compositing, dynamic image filters, Graphic Design, high school, how to photoshop, Photoshop Users, seniors, templates, varsity letters, virtual production studio, workflow.